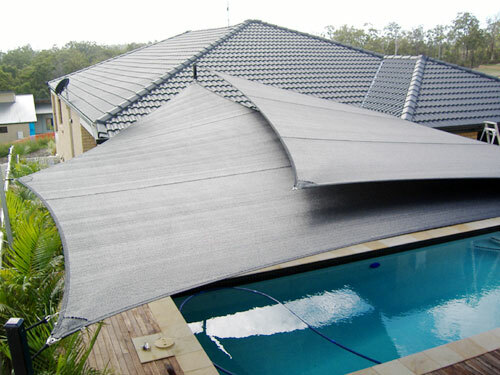 We have been manufacturing Shade Sails, PVC membranes for structures and Waterproof Shade Sails for over twenty years on the Gold Coast Queensland. Our dedicated team of trade specialists have many years experience designing, patterning, sewing and high frequency welding a variety of fabrics for all manner of shade solutions. We manage each individual project from quoting through design and manufacture. Each job being unique has its own requirements and is designed accordingly. After installation of anchor points, posts or structure the job design and measurements are brought to our factory in Molendinar on the Gold Coast Queensland where our specialists shade sail manufacturing division at Hunter Canvas & Shade pattern and manufacture the sail incorporating industrial equipment and techniques that result in accurate sizing and fit of each project. Working with and using industry recognised local and international textile suppliers and manufacturers our finished shade sails and waterproof membranes are tried, tested, durable and reliable. Backed by our own manufacturing warranty and that of our suppliers our shade sails are designed and manufactured to stand the test of time.Our major fabric suppliers include Rainbow Shade, Absolute Trade Supplies, Nolan UDA, Miami Stainless Steel and several others significant Shade Sail related trade partners. Our fabrics and their specifications are located are detailed on the fabric and specification pages.